One of the best place to buy cheap food, clothes, toys or just about anything, is the night market. At the night market, or locally referred to pasar malam, you can negotiate to get the best price for goods (only selected goods). You can also find many delicious food. All kinds of local food and consumer goods are displayed for sale. The tourist will see a Malaysian style shopping, and haggling and bargaining add to the fun and excitement. 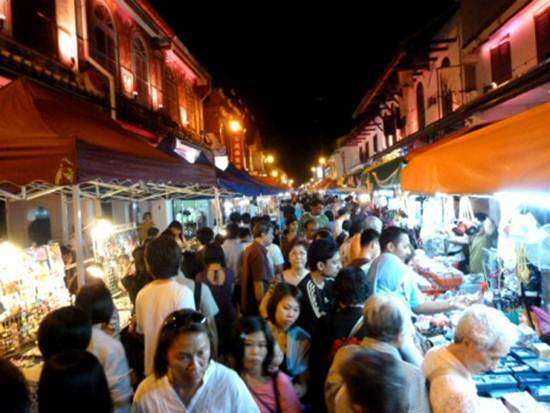 In Melaka, there are many night market held everyday. I hope that by listing them here, it will be easier for you to find one near you the next time you visit Melaka. Night market is the best place to spend your night in Melaka if you have nothing to do. You get to know the local people, local delicacies and a lot of souvenirs to take back home. p/s for locals, if you have any information about other pasar malam in Melaka, share with us. Awsome! I am loving it! Thanks for the list.